The mythology of William Shakespeare’s life has blinded history to the circumstances of his death, writes Simon Andrew Stirling. Over the years more than 50 different people have been identified as the “real” author of the works of William Shakespeare. They range from popular candidates – the Earl of Oxford, Francis Bacon – to rank outsiders, such as Queen Elizabeth I. We tend to imagine him as a slightly wayward lad from Stratford who went to London (no one knows when or why), where he made it big, entertaining kings and queens, and then retired to Stratford where he died, quietly, five years later. In fact, he died so quietly that nobody at the time thought to mention it. And, for reasons which have never been properly explained, he was buried in Stratford under a stone which does not bear his name. Rather, it lays a curse upon anyone who might “dig the dust” of his grave. So much mythology has been woven around Shakespeare that it becomes difficult to see how such an invisible man could have become the leading playwright of all time. Hence the “Alternative Authorship” theories. What we think we know about Shakespeare doesn’t really fit the image we have of a genius. But could it be that the story we’ve been told about Shakespeare is wrong? During the 25 years I spent researching Shakespeare’s life and times, I came across a brief reference to his skull. A Victorian clergyman had claimed that the “veritable skull of William Shakespeare” had been stolen from his Stratford grave and left in the crypt beneath the Sheldon Chapel at the church of St Leonard in the small village of Beoley, between Alvechurch and Redditch. It was an odd story, made odder by the wealth of incidental detail included by Rev Charles Jones Langston, vicar of Beoley, in the accounts he published in 1879 and 1884. Several things struck me about Rev Langston’s incredible story. Firstly, Shakespeare’s skull had allegedly been found in a funerary urn belonging to Ralph Sheldon, a very wealthy and prominent Catholic. Second, Langston claimed that the skull had a “jagged hole” in its forehead. Detailed study of a plaster of Paris death mask, currently in Germany and believed, in the 19th century at least, to be that of Shakespeare, revealed a distinctive “scar or indentation” immediately above the right eyebrow. 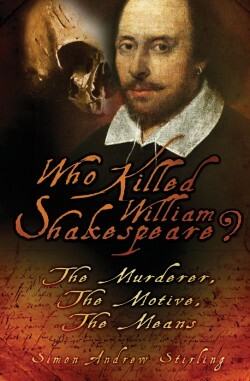 What I did not know when I sat down to write Who Killed William Shakespeare? in January 2012 was whether the skull described by Rev CJ Langston had ever existed – and, if there had been such a skull, where it was now. It came as a pleasant shock to discover that there was a rogue skull in the ossuary beneath the Sheldon Chapel. When Richard Peach had been following up the Rev Langston’s story for a piece in The Village magazine in 2009, he’d been lucky enough to gain access to the vault under the Beoley chapel. Just as I was writing up my notes about Langston’s story, I stumbled across Richard’s articles and his photos of the skull. There it was: the skull which was described 130 years ago as the “veritable skull of William Shakespeare”. But there was no “jagged hole” in the forehead. The mystery deepened. There was no jagged hole, but there was a definite mark above the right eyebrow – evidence of a violent blow, perhaps. Two of the most famous Shakespearean portraits show a strange lump or swelling beside Shakespeare’s left eye. The skull I was looking at in Richard’s photos explained the cause of that swelling. By then, I was under contract to write my book for The History Press. There was precious little time to stop and stare at Richard’s photographs. 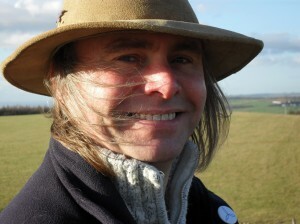 But I arranged to meet Richard at his offices in Alvechurch, and he very kindly showed me the other photos he had taken. As the months went by, I kept going back to Rev Langston’s story, and to Richard’s photos, and to Beoley. I studied the portraits of Shakespeare: the death mask in Germany, the Droeshout engraving from the First Folio of 1623, the Chandos Portrait in the National Portrait Gallery, and the busts in Holy Trinity Church, Stratford, and the Garrick Club in London. The closer I looked, the more I saw. None of this changed my mind about what had happened to William Shakespeare on or around his birthday in 1616. But what did emerge were more details about the probable cause of his death. These details were etched into the skull in the form of markings which are also visible on the death mask and in the portraits. It seems that Rev Langston might have been right after all: the “veritable skull of William Shakespeare” is indeed resting among the mortal remains of the ultra-Catholic Sheldons of Beoley. Even so, the story told by the vicar of Beoley in the 1880s doesn’t quite ring true. There is no evidence that Shakespeare’s grave in Stratford was broken into and his skull spirited away. I suspect that Rev Langston was trying to make sense of a local secret, passed down from one generation of the Sheldon family to the next. The skull of the Bard was hidden away beneath their private family chapel. It is a unique chapel, in that it is probably the only working chapel in a Church of England place of worship to boast an altar table that was blessed by a Pope. Somehow or other, Shakespeare’s skull had contrived to find its way to the most Catholic spot in the whole of the West Midlands. As for how it got there – well, the clues are written all over Beoley church and in the records of the parish. Around five years ago, Alve­church villager Morris Jephcott told me the story of how he had seen Shakespeare’s skull under Beoley church, writes Richard Peach. Many decades earlier, he had ventured into the crypt of St Leonard’s with his good friend, the Rev Evan Cruickshank, vicar of Beoley until 1946, after they had uncovered a copy of How Shakespeare’s Skull Was Stolen and Found. Morris, who has since died, saw my scepticism and some months later showed me a photo they had taken of the skull. This led to some internet hunting during which I found a copy of the story by “A Warwickshire Man” and was sufficiently intrigued to call the church to ask if I could have a look for myself. Quite by chance, St Leonard’s was to have its quinquennial inspection – a church building survey required every five years – the following day and the entrance to the crypt would be opened. So, on a sunny afternoon in September 2009 I was led by a church warden through a gap in a stone staircase down into the dark, damp Sheldon family vault containing the lead-cloaked coffins of a once-powerful family. Through a small gap we could see the ossuary, or bone store. From the large collection of bones it held, the churchwarden selected one skull and passed it to me. I had never held a skull and this one, no matter how famous it might be, felt cold and eerie, so I quickly passed it back with the excuse I needed someone to hold it for photographs. It was a great story to tell at the time, but I wasn’t convinced about the Shakespeare connection. Three years later, having talked to Simon Andrew Stirling and read his intriguing, detailed research, the chances that I have held the skull of William Shakespeare seem a great deal more likely. I think there might be a queue outside Beoley church for its quinquennial inspection next September.